With the Super Bowl kicking off next Sunday, the Atlanta Falcons face a team more than just the New England Patriots; they play against the man, the myth, and an NFL legend, Tom Brady. Fans of the games can once again take the opportunity to see the greatest quarterback of all time take the field on the game’s grandest stage. Making his 6th Super Bowl appearance, it is no question that Tom Brady is considered a Hall of Fame Quarterback after winning the Super Bowl four times and was honored MVP three times. 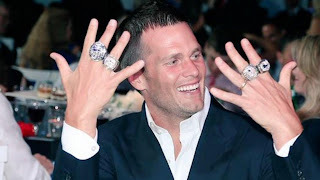 His efficiency in passing, effective leadership on the field, and the fact that the Patriots are always relevant in the NFL make it easier for a novice fan to root for the athlete that always wins. Tom Brady can be appreciated as a football star, but off the field he is a man that recognizes good deeds after rewarding an Elementary school football team season tickets with field passes for standing up to bullies. If exhilarating fans on the football field weren’t enough, Tom Brady also made you laugh after his appearance in a humorous scene in the movie “Ted 2”. So as you're watching the super bowl next weekend and don’t know which team to root for, you can observe history in the making along with admiring the kind of quarterback and person Tom Brady is.